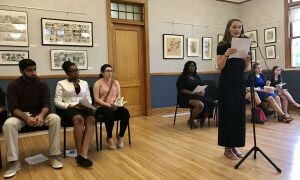 A week ago on Thursday 6/8/17 I attended a program at the library,”Abolition and Women’s Rights in Local History” presented by the students of Hudson Community Schools’ Writing Center at the Hudson High School. 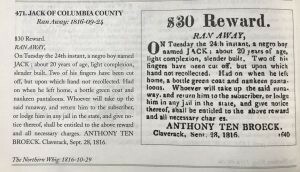 More about this project here. But, I want to focus on just one aspect here. 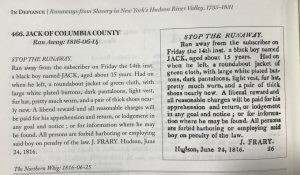 The program opened with readings of notices of runaways slaves from the Hudson River Valley. 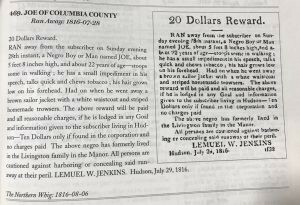 Many were notices from slave owners in Hudson and Columbia County dating roughly from 1795 to 1840. 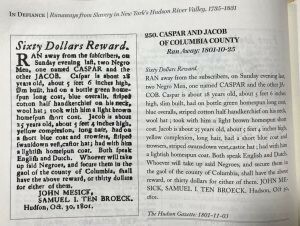 The source of these notices is In Defiance: runaways from slavery in New York’s Hudson River Valley, 1735–1831 ((Stessin-Cohn, Susan, and Ashley Hurlburt-Biagini. 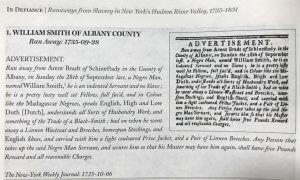 In Defiance: Runaways from Slavery in New York’s Hudson River Valley, 1735–1831, 2016.)) 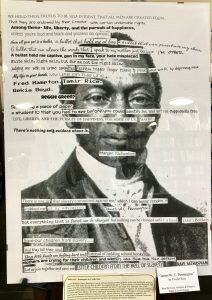 It is available in the library. 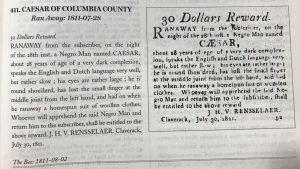 One hint about the deep history of slavery in our region is the fact that over 50% of the runaways spoke both Dutch and English. 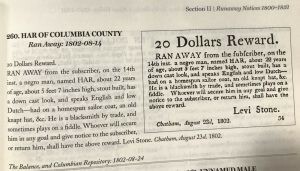 ((p324. Stessin-Cohn, Susan, and Ashley Hurlburt-Biagini. 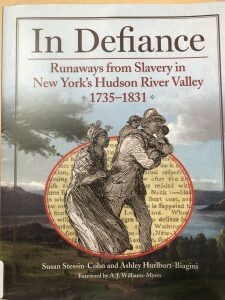 In Defiance: Runaways from Slavery in New York’s Hudson River Valley, 1735–1831, 2016.)) This is clearly an indication that they lived here long enough to learn two languages.